Paul Karl Feyerabend on "Science"
"More than one social scientist has pointed out to me that now at last he has learned how to turn his field into a 'science' – by which of course he meant that he had learned how to improve it. The recipe, according to these people, is to restrict criticism, to reduce the number of comprehensive theories to one, and to create a normal science that has this one theory as its paradigm. Students must be prevented from speculating along different lines and the more restless colleagues must be made to conform and 'to do serious work'." Source: "The Politics of Social Knowledge"
Karl Raimund Popper on "Normal science"
"'Normal' science, in Kuhn's sense, exists. It is the activity of the non- revolutionary, or more precisely, not-too-critical professional: of the science student who accepts the ruling dogma of the day; who does not wish to challenge it; and who accepts a new revolutionary theory only if almost everybody else is ready to accept it – if it becomes fashionable by a kind of bandwagon effect." Source: "Kuhn vs. Popper on Criticism and Dogmatism in Science"
See also: "On Revolutions and Progress in Knowledge"
I have been known online as kmarinas86. 5.2.1 Question: How is motion itself to be defined? Nature is an eternal mixture of wilderness and civilization. This user is a lapsed Catholic. 243+ This user has made more than 243 contributions to Wikipedia. This user is not a biological parent. Ps This user contributes using Adobe Photoshop. This user believes in materialism, the belief that everything that exists is made of matter. This user has never left the Northern Hemisphere. X This user is strictly apolitical. ._. This user sometimes watches anime. Rationalism—A scientist's way of generating guesses, from humble hypotheses to elegant theories. If something of importance is out there, it ought to be conceived. This is the basis for meaning. Empiricism—A scientist's way of generating data. If something of importance is out there, it ought to be discovered. This is the basis for discovery. Verifiability—A measure of the scientist's ability to incorporate a result within a larger theoretical framework. If something of importance is out there, it ought to be a recognized idea. This is the basis for defining the limits of knowledge. Falsifiability—A measure of the scientist's ability to detach or quarantine an idea from a larger theoretical framework. If a recognized idea does not correspond to the truth, it ought to be falsified. This is the basis for respect of the truth. The coherence theory of truth is wrong. Coherence respects the "meaning of man's words", but not the truth. The pragmatic theory of truth is wrong. Pragmatism respects the "preoccupations of man", but not the truth. The consensus theory of truth is wrong. Consensus respects the "limits of man's knowledge", but not the truth. , Action / Event 1.
, Action / Event 2. The next four sections discusses these four types of claims (in increasing order of objectivity). whether the quality is true or false. "I feel sick" because "it's wet outside". "That person is cool" because "they look cool in those jeans". "It's hot" because "it's very nice". "I feel sick" because "I inhaled too much rain". "That person is cool" because "they've said nice things to me". "It's hot" because "our team won the game". or it is tautological fact. Such qualities are not falsifiable given the limited context. "My temperature is rising" because "I have a cold". "They've said nice things" because "they are nice people". "That person helped us win the game" because "her strategy was excellent". and the only tautologies that are allowed in this form are explicit, rather than implicit. "My temperature is rising" because "I have caught flames on my sweater". "They've said nice things" because "they learn from other people who have said nice things to them". "That person helped us win the game" because "she scored the only points we needed to win". 2) all the masses the object interacts with? The latter is the correct answer. Analogously, we can think of the gyroscopic action of a spinning wheel. If the wheels spins, then gyroscopic precession may occur. If the wheel does not spin, then neither does gyroscopic precession. So either it is spinning or not, and it should not depend on some random observer. Take for example Mills' model for a rigid free electron disk. From the perspective of the external observer, the disk is a spinning disk of charge, and from the perspective of the disk of charge, the universe spins around it. To a distant observer (A), the charges in Mills' free electron disk model revolve coaxially around an axis (A_z), giving rise to a magnetic field with poles located at the center of the disk. However, a scientist studying this model and whose understanding is limited to the current understanding of man can easily assume that each charge in the disk has its own reference frame (B_i) which rotates about its own axis (B_i_z) at the same angular rate (B_i_ω) it revolves at exactly a right angle to the axis of the disk (A_z). If such reference frames were assumed, each charge in the disk, according to itself, cannot be affected by the collective magnetic field of the disk, for according to it (B_i), such a field would be non-existent (per the Lorentz force). As a result, from the point of view of each of these presumed individual reference frames (B_i), the electrostatic forces are no longer balanced out by the magnetic forces, and the whole disk would supposedly fly apart! Well the flat-earthers did get something right—the sun is not the center of the universe after all. Also, it certainly is moving non-inertially! So the search for a true inertial frame continues! If the disk was not spinning in our reference frame (B_1), we would expect no magnetic field, and the disk would disintegrate. How then could there be any agreement as to the magnetic field at any point in space (A vs. B_i)? One would have to account for the non-inertial components of our reference frame (B_1). Even if we knew the physical forces responsible for our non-inertial reference frame (B_1), the physical forces on the "arbitrary" (B_i) observer are virtually ignored in all of mainstream physics. So instead we have the concept of "fictitious forces", and the result is that the magnetic field is merely assumed to be simply defined in the inertial frame (A) and non-simply defined in non-inertial frames (B_i). Yet if the acceleration of our reference frame (B_1) is not known, we can assume egotistically, like Flat earthers who believed they lived on a non-rotating, non-revolving flat world with an edge, that our reference (B_1) is inertial while (A) is a non-inertial frame. There rarely is confidence in any claim of a classical solution for atoms in general for this reason, as well many others. The minimum condition for relativity of fields is that for a given frame of reference with respect to a particle, that particle's relative motion determines the line density surrounding it. This gives rise to the implication that line density is not intrinsic to space. According to a reference frame (B_3) that moves quick enough around a negative charge's "magnetic field" (in the center of B_2) to observe it as an "electric field" (in the center of B_3).... Will the electric field perceived by the reference frame (in the center of B_3) really have a distribution that will give the charge (in the center of B_3) the equivalent of two magnetic poles preserving the magnetic attraction (as represented in B_2)? Per the above diagram (where the observer is limited in that one cannot account for motions outside the picture and thus cannot account for the origin of the motions in the picture): One observer (B_2) might calculate (based on information available to (B_2), with respect to (B_2)'s own position) very different magnetic fields for the same object than another observer (B_3) would (based on information available to (B_3), with respect to (B_3)'s own position), with a stark difference in the implied consequences. The Butterfly effect of Chaos theory would imply that a small difference in force can lead to very different effects, which in turn would affect each observer differently. It would mean that different observers (B_2 & B_3) exist in separate parallel universes. To extend that point further, if this was true, then the person you think you knew yesterday, or even the second before, could be a completely different observer now, and that observer who looked back at you would no longer see you, but some other version of you, placing that observer effectively in some other parallel universe. One observer would be living in one "Matrix" and the other observer in a different "Matrix", and it would be mere coincidence that some well-defined and numerically-limited set of observers, unlike others, share the same "Matrix". Ask yourself, "Is this branching away of universes a phenomenon accessible to science?" Mach's principle, if iterated, implies a fractal structure of the universe. (Specifically Mach principles Mach3 and Mach6 given by Hermann Bondi and Joseph Samuel). Mach3: Local inertial frames are affected by the cosmic motion and distribution of matter. Mach6: Inertial mass is affected by the global distribution of matter. If fields are intrinsic to space, it makes intuitive sense that their computation is derived from the computation of variables that are also intrinsic to space. Basically, they depend on the causative origins of past particle movements. Question: How is motion itself to be defined? —obvious, for the latter would lead to perpetual motion. Similarly, if we consider two charges accelerated through artificial means in a laboratory, we must consider the work done on each charge, relative to the inertial frame of the laboratory, to predict the field energy of each charge (accounting for any radiative losses)—not their relative velocity. Item 1 proves that a relative velocity, defined by some random observer's motion subtracted from the motion of an observed particle, does not by itself have any bearing on the value of energy, or the form thereof, which the observed particle may have. That relative velocity has causative origins, but it cannot be explained by merely comparing its motions relative to some chosen observer. With respect to what does the total kinetic energy of a particle come from, including the part of kinetic energy not gained in acceleration relative to either a flat terrain (as per item 1) or a lab (as per item 2)? The energy responsible for this work done on a system is contributed by the sum of all particles in the universe outside of that system. Thus, total kinetic energy, momentum, and angular momentum received by a particle ultimately is defined in relation to a reference frame where the net momentum and angular momentum of the sum of all particles in the universe is zero (i.e. the universe's inertial frame). The universe's inertial frame is one in which all momentum and angular momentum in the universe cancel out to zero. Also, for each positive helicity, there also exists a negative helicity of equal, but opposite value to match. If a particle possesses a positive helicity with respect to the universe's inertial frame, then sum of everything else adds up to an equal, but opposite negative helicity to match it... ...and vice versa. For each positive charge, there also exists a negative charge of equal, but opposite value to match. If a particle possesses a positive charge, then sum of everything else adds up to an equal, but opposite negative charge to match it... ...and vice versa. The universe's inertial frame is the most fundamental vector space behind all physical phenomena. The kinetic energy of an object is a direct function of its velocity with respect to the universe's inertial frame only. , and the other 50% of its strength is derived from the sum of the revolving motions of every other particle in the universe. In the particle frame, 100% of the point magnetic field appears to be produced by the rest of the universe. So, If that which is said to produce a certain field at a given point were its own observer, it would observe that the rest of the universe generates that same exact field at that same exact point. For example, if according to one observer, an electron's motions were observed to net a magnetic field of 1 Tesla at a particular point, then according to that electron, the rest of the universe nets a magnetic field of 1 Tesla at that particular point. This implies that the characteristics of the universe must be limited in some way. Speed - The speed of every "mass-energy-charge" must be exactly equal to the speed used in deriving the mass-to-energy relationship. In this case, it is the speed of light. All energy and matter are fundamentally 100% comprised of MECs. A MEC. All MECs are circularly polarized. A sum of MECs may result in a elliptically polarized photon provided that the MECs added together have opposite rotations. When the oppositely rotating MECs pass each other twice per rotation at points separated by 180 degrees, such that they occasionally exist the same line radial to the path of propagation (allowing them to travel through a thin small gap), then the photon is linearly polarized. The spin and propagation velocities are orthogonal to each other. 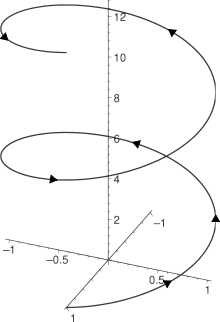 The handedness of the corkscrew motion is determined by the sign of the cross product of the spin velocity and the propagation velocity. Due to conservation of angular momentum, the total fluid helicity of the universe and the total magnetic helicity the universe are both zero in the universe's inertial frame. The magnetic field of each MEC is aligned with its propagation, and thus it is in-phase with the electric field associated with it. Magnetic helicity is due to the deflection of each propagating MEC, while the fluid helicity is derived from the corkscrew path of each MEC. An MEC is observed as "mass" when its path of propagation is folded into a volume as small as a subatomic particle. The mass of a MEC exists even when propagating outside what is deemed "mass". MECs travel along magnetic field lines such that the corkscrew motion combined with their charge produces a magnetic field aligned with the external magnetic field. , electrical forces may only interact in the plane perpendicular to the propagation velocity, which does not allow the electrical forces to change the speed of each MEC—only its direction. Therefore, electrical forces on MECs lead to centripetal and centrifugal forces only, which prevents an infinitely dense singularity from forming via electrical means. A change in electrical potential then is merely the result of changing the rate at which momentum is applied (i.e. force) at a right angle to the motion. If MECs must be added to a system to add to its momentum, then force is an exchange of MECs. Special relativity is appended to assume that the only physically valid coordinate space is the universe's inertial frame. In this way, the Relativistic Doppler effect can be accounted for by a reference frame where objects undergo a true (not relative) Lorentz contraction within a universal space that does not itself undergo any Lorentz contractions. approaches zero. Thus, at relativistic speeds, more time is required by an MEC to circumnavigate a mass, or a part of it, and time dilation is thus explained without space-time manipulation. The space between objects consists of a higher density field of MECs. Gravity results from the tendency for MECs to leave an object where the MEC density gradient drops sharply due to less interference with other propagating MECs in that direction. Thus MECs are continuously being expulsed from mass in a direction away from other nearby masses, acting as a propellant that causes the masses to rocket into each other. The closer the proximity to other masses, the faster MECs are emitted. The surface density increases with the square of the proximity. This results in gravitational attraction obeying Newton's law. When atoms gravitate toward each other, MECs constitute a significant flow out of atoms. However, due to further interference, most MECs do not fully escape masses from which they came, and instead most return within nanometers of being sent out. Thus frequency and density of collisions are such that atoms are time dilated, for MECs of which they are comprised take more time to complete a round-trip in the atom when these interruptions cause each MEC to instead take a more jagged path. When the pressure of electrical repulsion between atoms matches the pressure due to gravitational attraction, it actually means that rate at which larger distant masses such as stars and black holes are losing MECs is enough to make up for the losses by much smaller masses. Thus, MECs generally migrate from larger, central masses to smaller, peripheral masses. A radius for peripheral mass is reached where opposite forces are in balance over the area of that object, helping to maintain the number of MECs that comprise that mass. Absorption of MECs from distant masses has the effect of returning mass-bounded MECs to a higher gravitational potential so as to not to continuously fall. Larger, central masses must therefore rely on much larger masses to supply further MECs, but if those do not exist, then masses would have the appearance of shrinking with respect to the universe's inertial frame, which could be interpreted from the inhabitant's point-of-view as an accelerating expansion. My comment on a particular YouTube video (http://www.youtube.com/watch?v=C_i2ft90fwk) concerning Le Sage's theory of gravitation. "If the particles of Le Sage's theory had constant speed and energy, then many of﻿ the objections to Le Sage theory can be falsified. This requires that each particle of Le Sage's theory have a planar field of repulsion that is orthogonal to the path of the particle, rendering the collisions perfectly elastic. Le Sage particles that transfer force would be traveling in parallel for a mere instant. Thus, the Le Sage particles would approach at an asymptotically shallow angle to transfer momentum in steps." The requirement that the net force must only occur at a right angle to the velocity means that any force backward or forward with respect to the path of the particle must somehow be negated. If two particles are to be regarded as acting with one another through this field in such a manner as to neither gain nor lose speed or energy, then such particles must be traveling parallel to each other at the time of the force transfer. Only when we allow for direct superposition of two particles as being the criteria for force transfer between two particles may two particles moving in parallel have an exchange particle that is essentially the same speed as the two particles in question. However, in greater detail, we must realize that when the distance between such particles is non-zero, to explain how two particles moving in parallel may interact, we must consider the existence of particles that are faster than these which mediate the force in the plane orthogonal to their paths. To the extent that force actions can occur without superposition, the extent to which the mediating particles must travel faster than the things which they exchange between. Whether or not the force interactions occur at a distance, it is clear that for the force interactions to not change the speed of particles in question, the force must occur as stepwise changes of the directions of particles. If two particles in question are in reality a construction of innumerable, infinitesimal particles, then the stepwise changes of the directions of particles leads to a continuous everywhere but differentiable nowhere path for all particles. The universe from that point possesses significant asymmetry. The angular velocity of charges in that motor must be greater than expected. Thus, the possibility for there to be an electric motor in that region of space whose charges possess the same motions that they would when placed elsewhere is contingent on the asymmetry of the universe about that point. If no corresponding asymmetry exists at that point, the electric motor will not both exist there and operate normally. If one observes that certain properties of that electric motor must operate normally under any observed condition it can experience, then the electric motor is forbidden to operate in a place where the asymmetry around it is very low. In many cases, the proposed ultimate constraint would forbid the electric motor from going to the region, whether it is operating or not. In a very specialized case, there would be situations where the arrangement and motions of matter about a certain point require that a certain object exist there, or otherwise the arrangement of matter and motion is unphysical. If the characteristics of this object were to be implied by the characteristics of the motions of other particles, then one could infer that at some locations, other objects must exist that bear a resemblance to that object. Thus, the existence of a single lifeform in the universe may in fact be dependent on the existence of another lifeform similar to it, and the existence of a star would be dependent on there being other stars similar to it, and ad infinitum. If one argues on the basis of (C3) that this situation involves an accelerated charge which should always radiate, the argument is erroneous, because the fact that a charge is accelerated does not necessarily imply that it radiates, unless the acceleration takes place relative to an inertial observer. A noninertial observer uses different clocks and yardsticks. Thus, even though the charge is accelerated, it follows that, because the observer is also accelerated, the co-accelerated observer sees no radiation. Seeing radiation and whether or not radiation actually occurs are two different things! This relativism of reality to me is complete nonsense. I cannot fathom why physicists even believe in such a model. As far as I know, what matters here is whether or not the summation of fields at a particle's location is changing with time. So if the field intensities and directions do change in the vicinity of the charge, then it stands to reason that the charge will radiate, but the energy of the radiation must be derived from the value of the fields at this local intersection point only. This requires that those field intensities are invariant with respect to the observer chosen. However, in order for this to work, the motions of particles must be limited to that which results in the same values for the fields regardless of any translational and rotational transformations of the system, so not just any randomly arranged set of charge motions will satisfy this condition. This requirement goes beyond the very basic conservation laws. I've said this once, and I'll say it again. Fields must be intrinsic to space. They are all frame dependent, and you, as usual, do not specify any frames. Consider the example of a falling electron, a light sensor, and a nuclear weapon. According to falling observer A, the electron is not accelerating. According to observer B, who is sitting on his rocking chair, the electron is accelerating. Observer A claims that the electron is not radiating. Observer B claims the electron is radiating. The electron falls down in front of a sensor, and the sensor detects its light. The sensor sends a signal to a control board which automatically detonates the nuclear weapon. Both observers are killed. So who was right? Observer A or Observer B? That is no static electric field. A static electric field is a conservative field. For the electric field in question to trip the detector, it has give off energy to that detector in the form that it will accept. In this case it is a photon. Therefore, the electric field in question is a non-conservative field. This implies that the very act of detection must coincide with an acceleration of the electron with respect to the background field. Each point of the background field has its own inertial frame and it is fundamentally derived from the motions of surrounding charges. Some have speculated that gravity is a fourth-order effect of electromagnetism. In consideration of this background field (Mach's principle), there can only be one valid interpretation. This is very strange phraseology. Do you think this is how it should be discussed? Well, yes, I do, actually. This however leads to the question: what is radiation? Suppose you are sitting [briefly] in a vacuum chamber. You are holding a little pickup coil which is shorted out with a resistor. An electron comes flying by. It induces a current in the pickup coil. This causes the resistor to heat up a little bit. This is a transfer of energy from the electron to the resistor. The electron's path changes slightly. It loses energy. But has radiation occurred? Was energy transferred to the pickup coil by an EM wave or by photons? Now, consider as before: suppose you and your pickup coil are moving along with the electron instead of sitting still and watching it go by. Will the pickup coil have any current induced? I say not. That is, no radiation is perceived in that frame of reference. And in that situation, assuming no gravitational field, the electron is not accelerated and does not lose energy. Third situation: the electron is orbiting in a gravitational field. It is being accelerated by that field. A pickup coil moving with the electron does not pick up an induced current. However a pickup coil in another frame of reference will see radiation because an accelerated charge radiates. The electron will lose energy, even though it itself does not perceive radiation. The disagreement between WillJ and me on one side and Barchak-Petkov on the other is as follows. Petkov says no radiation occurs when an electron is falling (accelerating) under the influence of a gravitational field. He says this without qualification, i.e., without specifying the frame of reference. Further, he says the electron follows a geodesic path. Whether a path is geodesic or not does not depend on the frame of reference; it is strictly defined by the geometry of spacetime. Therefore what Petkov is saying is that no one in ANY frame of reference will see radiation. This contradicts my argument and it contradicts what Rohrlich has said. This is all apparently a little too subtle for Barchak, whose main goal in any case is to prove I am a lunatic. Perhaps you agree. An electron will radiate if it is displaced along E field lines and/or across B field lines. Gravitation can cause such displacement to occur. Is the power of stars controlled by a single external reference frame to the exclusion of any others? There is no such frame. Are there "multiple" realities of a star, one for each reference frame? Obviously not. 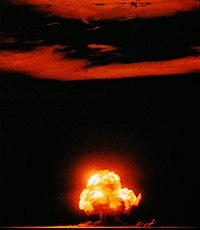 may i ask a question here about about this business of radiation being relative? i know you are talking mainly about spaceships and so forth, but suppose instead you have an elevator on the 10th floor of a high-rise, into which alice then enters, but unhappily trips over this wretched charged brick carelessly left on the elevator cage floor, but being severely overweight, the accident then causes the safety mechanism to fail, and alice, the brick and the entire elevator cage then rapidly go into free-fall, and on its way down they all pass by charlie waiting impatiently on the 4th floor. for relative to charlie, C, the charged brick, B, is accelerating, downwards, so he should see radiation, real photons that is, coming his way, but of precisely what colour would these photons be? and suppose that there is a little glass window securely affixed to the inside of the elevator cage through which the radiation would have to pass to reach charlie. glass windows by their nature reflect some of the incident light, so would not alice see some of the radiation passing from B to C reflected back her way? but, alice and the window and the brick are all unmoving with respect to each other, (unmoving that is since by now alice has fainted with fright) but if she were to open her eyes momentarily, would she or wouldn't see anything coming her way? (apart from the grim reaper that is). any thoughts here? regards f.c. This business of "radiation being relative" is utter nonsense. It is very misleading. What is really going on is that not only do charged particles have a velocity with respect to the observer, but so do the magnetic field lines. A relative velocity is created by a charged particle and the local magnetic field that is superimposed upon it. That relative velocity, v, is what determines the radiation produced. To preserve causality, the instantaneous value of B and its v must be intrinsic to the space in which q exists. In general, magnetic fields must be intrinsic to space. Zero relative velocity means no deflection and, therefore, no radiation. When there is a non-zero relative velocity, the resulting deflection may result in radiation, but only if there is a change in kinetic energy in the charged particle. Cyclotron radiation is produced only when the energy of the charged particle changes. Radiation requires that the charged particle is not moving parallel to an equipotential surface of the magnetic field. 1. A charged particle is traveling at constant velocity through empty space. Traveling parallel to it, at the same velocity, is a little pickup coil. No current is generated in the pickup coil. 2. A charged particle is traveling along through empty space. It flies past a pickup coil which you can think of as 'stationary'. As the charged particle goes past, a current is induced in the pickup coil. Energy is transferred from the charged particle to the coil. Is this radiation? I think a reasonable case can be made that it is. "The business of 'radiation being relative'" which I speak of does not refer to two different setups with different initial and final conditions. It refers to the whole buzz here on HSG about whether radiation is relative to the observer chosen for any one given setup. Many have said that whether a given setup produces radiation varies by the observer, but I say it does not. A radiation event clearly indicates the dissipation of kinetic and/or potential energy of the charged particle which is lost by the charged particle (i.e KE+PE falls for the charged particle). This cannot be explained as simply "conversion" of the charged particle's electric field into a magnetic field because the energy of the charged particle as a whole is reduced, and the proof is that the radiation would be able to increase the energy of another particle. For an object to radiate in one frame, but not the other, violates causality. In the weak-field approximation, you can certainly prove things about weak fields. And Rohrlich points to the general case. The conceptual segregation of weak-fields and strong-fields can cause one to mischaracterize physical laws. Conceptual segregation does not give us physical laws; it gives us "engineer's laws". If approximations of law are equated with law, the result is internal inconsistency. "The business of 'radiation being relative'" which I speak of does not refer to two different setups with different initial and final conditions. It refers to the whole buzz here on HSG about whether radiation is relative to the observer chosen for any one given setup. Many have said that whether a given setup produces radiation varies by the observer, but I say it does not. Maybe I should have gone the next (and obvious) step in my mental experiment: Imagine that you have a charged particle moving through space, and two pickup coils. One moves exactly with the charged particle, i.e., in the same inertial frame, while the other is 'at rest', i.e., in a different inertial frame. The charged particle induces a current as it moves past the 'at rest' coil, while it does not for the coil in its own inertial frame. Same setup with regard to the particle; the observer in one frame perceives radiation while the other does not. Both coils agree that one of them is receiving induction. It is not as if the coil moving with the electron says, "The electron is not interacting magnetically with the other pickup coil". Your example, in fact, does not claim that one coil "denies" that the other receives energy from the electron. What I am essentially up against is the insistence by some that whether or not a particle radiates at all, or interacts magnetically with an object at all, depends on the frame of reference of one's choosing. Addendum In your coil example, the electron interacts with one of the coils. Due to electromagnetic induction, that coil generates a magnetic field which produces an emf into the other coil, regardless of orientation. It may be small, but it is still there. The emf will be a repulsive force per Lenz's law. Also, the electron will be deflected as it dissipates energy to the coil, rendering the assumption of inertial movement with respect to one of the coils impotent. Also, the electron will be deflected as it dissipates energy to the coil, rendering the assumption of inertial movement with respect to one of the coils impotent. True enough, there is essentially an infinite sequence of interactions - the stationary coil does create a changing field which affects (accelerates) the electron, which then affects the stationary coil, which etc. The after-first-order interactions are extremely weak. The infinite sequence will converge. Regarding the second point about the assumption of inertial movement: you may as well assume the charged particle IS the coil, i.e.., that the 'moving' coil itself has an electrostatic charge. Clearly in that case, if it is rigid, its movement with respect to its own frame of reference is inertial. In which case that is not an "impotent" [whatever that means ...] assumption. What does it mean? At least one of the charged particles in the system must be in an accelerated reference frame. Also note that this perspective can be reversed. From the other reference frame, it can be just as fairly claimed that your electron, which you claim as having an inertial reference frame that references itself, is really in an accelerated reference frame that is to be referenced in relation to other accelerated reference frames. Let me try a different tack. Really, I think we need to think about this in the same way one thinks about 'test charges' in an electrostatic field. One thinks about them as infinitesimal, so you can consider what the forces are on them without having to worry about what forces they in turn induce on their neighbors. In this case you need to think of the pickup coils as infinitesimal. No current is induced in the teeny weeny little pickup coil that travels with the charged particle. Meanwhile, the 'stationary' pickup coil that observes the charged particle whizzing by does have an induced current; to it, the electron appears to be radiating. Because it too is infinitesimal, however, it does not in turn have any effect on the (non-infinitesimal) particle or its accompanying pickup coil. This way of thinking about it essentially brings out only the first-order radiation effects, which are what really matters - it shows that the moving particle causes effects which are felt in a stationary frame in its neighborhood. It must be not moving parallel to the axis of that pickup coil. The pickup coil is not symmetric around that axis. If the charge in the infinitesimal moving pickup coil generates an emf into the stationary pickup coil, are we supposed to ignore the effect that would have on the direction of the charge? You say the charge does not radiate in the frame of reference of this "accompanying pickup coil" in which it exists, yet according to the stationary pickup coil, the electron will radiate. If the charge says, "No sir, I am not the one who is radiating." what would your reply be? Imagine the charge traveling through many of these coils. The charge says, "See I went through many hoops, and I still haven't lost my kinetic energy. I am still going!" Yet you know each time it passed through a coil, a voltage spike was received by each coil. Inducing current and voltage into a coil requires energy to be transferred. Based on the above discussions, it is clear that we need to have a section on 'induced magnetization', and a section on 'source magnetization'. The latter will be about permanent magnets. It would seem that the equation B = μ_o(H + M) is ideally suited to 'induced magnetization'. In modern textbooks, the vector B is introduced first, often defined through F = qv×B. Then they introduce induced magnetization M. And finally they introduce H. However, there is never any attempt to hide the fact that H is the driving force, and that it is analogous to E, and historically, H came first and Maxwell's papers use μH. It should also be remembered that when we use the equation B = μ_o(H + M) it is only a broad macroscopic equation which deals in averages and simplifications. Molecules are considered to be rotating dipoles which all align in sympathy with the magnetic field. Permanent magnets are a different topic because the magnetization is the actual source of H.
And as regards the dilemma that divB = 0, whereas M, which is part of the B function ends abruptly at the boundaries, this is not a problem. The M lines may end, but they don't end at sources or sinks. They just end. They are solenoidal where they exist, in sympathy with the H lines. Because B only makes sense in terms a point in space and time, the equation should really express itself as B(x,y,z,t) = μ_o(H(x,y,z,t) + M(x,y,z,t)), if using rectangular coordinates for example, and thus M(x,y,z,t) is the magnetization at point (x,y,z) at time t, and H(x,y,z,t) is the background magnetizing field at point (x,y,z) at time t. These are instantaneous. It is not as though H(x,y,z,t) causes M(x,y,z,t). You can say that H(x,y,z,t) allows M'(x,y,z,t) to be non-zero, such that it affects the difference between M(x,y,z,t+α) and M(x,y,z,t-α), where α is some arbitrarily small positive real number. Induced magnetization is what you talk about when you speak of generating a magnetic field. This implies a change between two different times. What is left when the magnetic field is not being generated anymore is the remanence, which you cannot simply refer to as the "M field". To find the remanence, you remove the H-field (possibly a bar magnet) at time t, making H(x,y,z,t) effectively 0. Of course, if you have two permanent magnets, the one outside the borders of the page could be treated as the source and sink of the H-field, and the one inside the page could be treated as the block in which the M-field resides. But interestingly enough, that permanent magnet outside the page can easily have its own M field. This further emphasizes the need to treat B, H, and M as intensive properties, not extensive properties (see Intensive and extensive properties). The source and sink of H(x,y,z,t) is a set of points. The source and sink of M(x,y,z,t) is point (x,y,z). "The scenarios which we have been discussing are all frozen in time." "It is with regard to the issue that the H field reverses its direction inside a permanent magnet, giving rise to magnetic H field monopoles at each end of the magnet." ....due to latter statement's need to imply a movement, which obviously cannot be described as "frozen in time". "You will no doubt agree that if we integrate an H field around a loop which goes through the middle of a closed electric circuit, that we will end up with Ampère's circuital law, and we will have a distinct value for electric current in the equation. Can you please explain to me why this should not be so if we replace the source electric current with a permanent magnet." "At the moment we are focused on 'magnetization current', and the question is 'why are textbooks such as Grant and Philipps disregarding the magnetization current in a permament magnet when they are making the argument that the integral of H around a closed loop which passes through a magnet will be zero?'." I am new to wikipedia user/editing, and I have no idea how one sends another member private message, etc. I'd rather discuss over email, etc. Anyway, feel free to drop me a line. This page was last edited on 18 March 2017, at 22:39 (UTC).